VITSIL glass distillation units continue to be the most effective, economic method of producing ultra pure water for laboratory use. By contrast de-ioniser are only effective in removing those substances which are ionized. Further the resins contribute organic impurities to water and an ideal environment for bacterial growth in course of time. 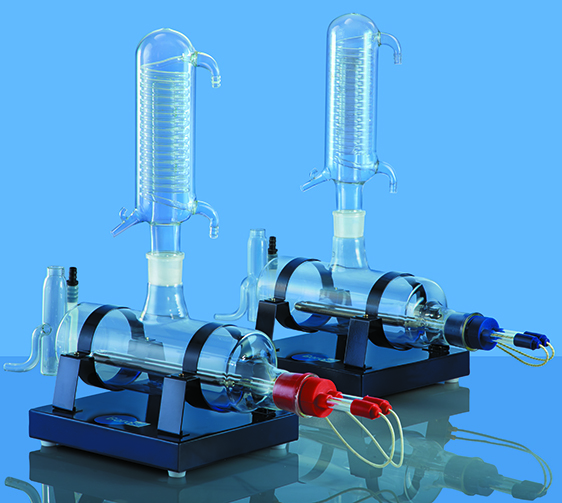 These distillation units are designed to produce a distillate of consistent purity. The unit consists of horizontal borosilicate boilers, condensers and quartz heater. All parts are replaceable. The newly developed quartz heater is advantageous than chromium plated heaters used by other manufacturers. Chromium plated heaters react with acids during cleaning process. Quartz heaters do not react with acids or water during cleaning or at elevated temperature unlike metallic ones. Quartz heaters are easy to assemble and dismantle, unlike metallic ones which are bulky. Economical and ideal for colleges and general laboratory use. Provision for easy cleaning of boiler. Cooling water consumption 50 lt/hr. 60 lt/hr. Cooling water consumption 100 lt/hr. 150 lt/hr.